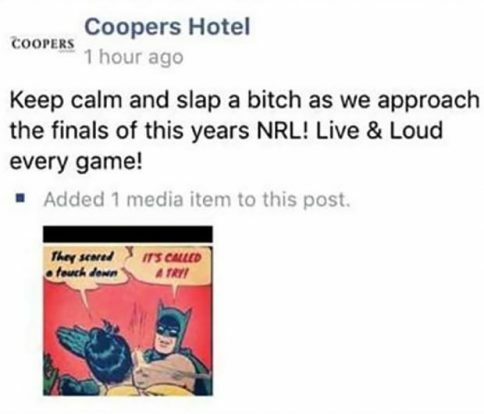 The general manager of the Coopers Hotel in Newtown, Sydney, has been fired for making comments that appeared to condone violence against women on the pub’s Facebook account. The post was eventually deleted and Wright published an apology on the Coopers Hotel Facebook page, taking responsibility for the post on Wednesday evening. The original post has been widely decried by followers of the pub on social media, but many also noted that this is not an isolated incident, with users pointing out a misogynistic tweet from the pub’s Twitter account earlier this month (below). Since then the pub has been hit with a slew of negative ratings on Facebook, with its average at the time of writing sitting at 2.8 stars out of five.